We've partnered with Lemonade to provide affordable renters insurance policy options! Simply put, renters insurance covers damage to your personal property anywhere in the world. A renters insurance policy covers your clothes, your couch, and even your kitchen appliances. If your apartment were to burn down, renters insurance would cover your personal belongings. Moreover, renters insurance also offers liability and additional living expense protection. It would cover damages or injuries suffered by someone else on your property. In the event of a covered loss, renters insurance would cover temporary living expenses. What is not covered by my policy? Renters liability insurance provides coverage if you are found legally liable for damages or injury occurring on your property. This comprises someone suffering an injury on your property, your pet biting someone on the premises, or structural damage caused to neighboring apartments. Renters liability coverage typically starts at a coverage level of $100,000 but can be increased. It’s important to keep in mind the events renters insurance does not cover. Renters insurance doesn't protect anything you don’t own. The structural aspects of your apartment or home aren't covered by renters insurance, only your belongings. Renters insurance also doesn’t cover damages caused by earthquakes or floods. Some insurance companies offer additional earthquake insurance, while flood policies are typically handled through FEMA. Landlords typically do not provide renters insurance. It's a product you should shop for and purchase yourself. Take inventory of your belongings. This will help you determine how much coverage you require and speed the claims process in the event of an incident. If you’re sharing an apartment, consider sharing a renters insurance policy with your roommate. Sharing a renters policy splits the bill — although renters insurance is often relatively affordable to begin with. If the policy is in your name, any claim your roommate files would be on your policy as well. If your roommate files multiple claims, you could face a rate hike or policy cancellation. For more information on car insurance with roommates, consult our guide. If you own high-value belongings, inquire about coverage for those items. You may want to consider a floater — or an endorsement. A floater is a coverage add-on for a high-value item that exceeds normal policy coverage limits. If you own a piece of jewelry appraised at $15,000, you would need a floater to protect that item above-and-beyond the typical renters insurance jewelry value cap of $10,000. Floaters and endorsements extend to other items, including works of art, firearms, or film equipment. The cost of renters insurance depends on the value of your property. In order to give you an estimate, we averaged personal property limits of $25,000 and $50,000 from top companies across the US. The average annual rate for a renters insurance policy is $188. In addition to protecting your belongings, renters insurance can lead to discounts on other lines of insurance — namely, auto insurance. Consider bundling your renters and auto insurance insurance policies to obtain a multi-policy discount. 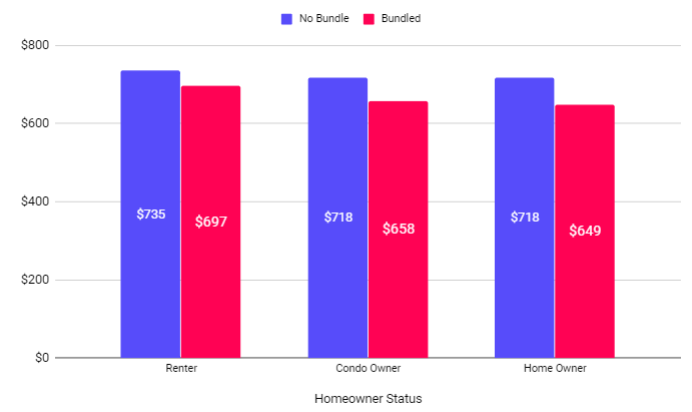 Bundling renters and auto policies can save you an average of $76 per year! Review a few of the most commonly asked renters insurance questions — and answers — below. Not by law. Renters insurance is not legally mandated in the United States. However, a landlord may stipulate a renters insurance requirement at their discretion. Renters insurance may not be required by state law — like auto insurance is, for example — but it's a smart purchase to make. It's an affordable way to keep your landlord happy and your property safe. It depends. Renters insurance typically covers many of the damages that may occur as a result of a hurricane, including wind, fire, hail, or lightning. However, most renters policies do not cover damage caused by water damage via floods or storm surge. When you file a claim following a hurricane, your renters insurance company will investigate to determine which damages were caused by "covered perils" and which happened as a result of water damage. No. Renters insurance typically does not cover water damage caused by flooding or storm surge. If you live in a flood- or hurricane-prone location, you should consider purchasing a separate flood insurance policy to account for the possibility of losses caused by flooding. Can I get renters insurance if I have a dog? Yes, unless your dog appears on your renters insurance company's list of excluded breeds. Renters insurance is a wise investment if you own a dog, as liability coverage will cover your expenses in the event your dog injures someone at your home. But insurance companies often restrict the types of pets they cover, withholding coverage for renters who own a Pit Bull, Rottweiler, German Shepherd, or other dog breed deemed too risky to insure. Taking the plunge and purchasing a home? Learn more about homeowners insurance. Do I have coverage against damage caused by a fish tank? Does my renters insurance coverage damage to my vehicle?